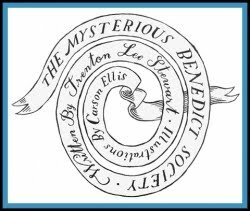 Over the past year, we have been reading a great series of books - The Mysterious Benedict Society by Trenton Lee Stewart. My daughter had received the first book as a gift for her birthday last year. I can't say enough how much we have enjoyed reading these books together! I read them aloud to my nine year old because they are quite advanced - the vocabulary is wonderful (I always keep a dictionary on hand when we read). The first book is simply The Mysterious Benedict Society, and there are two additional books in the series, The Mysterious Benedict Society and the Perilous Journey and The Mysterious Benedict Society and The Prisoner's Dillemma. The books are purely for fun for us; they aren't a part of any curriculum. I would classify them as fantasy and/or mystery. The stories center around Mr. Benedict, a brilliant elderly man who suffers from narcolepsy. His trusty sidekick is Number Two, who makes sure she is with him at all times (in case he falls asleep!) He has issued a challenge in the newspaper for "gifted children looking for special opportunities". The children that respond are all such fun and quirky characters. Once the children are selected the "Mysterious Benedict Society" is born, the books then are based on their adventures. Each book contains many word puzzles which, interestingly enough, my daughter picked up and solved much quicker than I did! I think my daughter loves the books because the children are such strong characters, each with their own very definite thoughts and ideas. And, they solve mysteries with little or no help from adults. My daughter will tell you her favorite character is Constance Contraire - a young girl who is highly intelligent, but very small. She rides piggy back most of the time just to keep up. Her attitude is pretty funny! At the end of the first book the reader finds out a hilarious truth about Constance. If I told you, it would spoil it for you. If you want to learn more about the books, just poke around at the link I gave you earlier - the website is so well done and has lots of activities for kids to print and do online. If your children have some favorite "fluff" reads now, can you leave me a comment a tell me what they are? We're always looking for new reads to put on the shelf!